Anteaters can dig into logs and termite mounds with sharp long claws. They walk on their knuckles to protect these claws. Anteaters do not have teeth. They use their long, sticky tongues to lap up insects from inside termite mounds and ant hills. In relation to their body size, they have longer tongues than any other mammal. A baby anteater will ride on its mother’s back until it is almost half her size. Their stripes blend together to look like one big animal – less likely to be eaten. Off exhibit, anteaters are given items to rip up like boxes, paper, and logs. They also enjoy avocado and worms as treats. 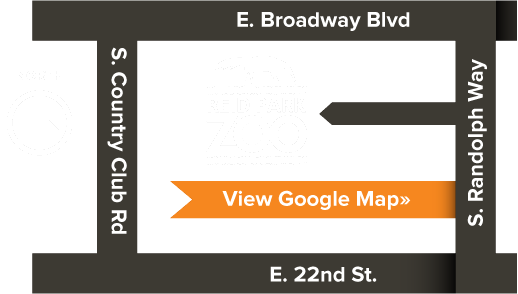 The giant anteater is the symbol of Reid Park Zoo. Anteaters born here are now living in zoos all around the world!